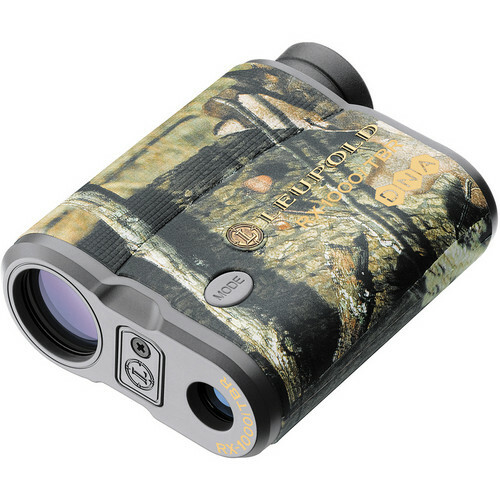 The mossy oak camouflaged 6x22 RX-1000i Laser Rangefinder from Leupold integrates a 915nm Class I IR eye-safe laser into a fully multicoated roof prism monocular to make an accurate and versatile optical system. 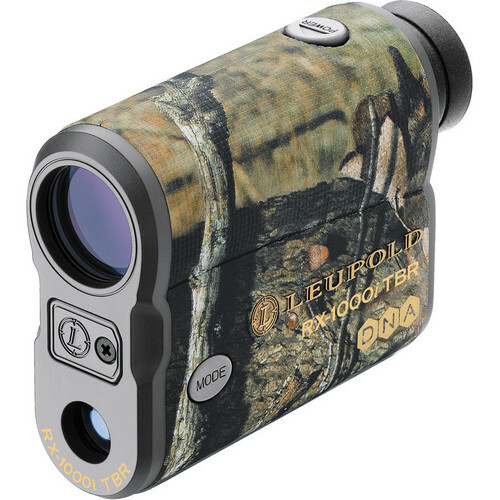 The rangefinder features Leupold's True Ballistic Range (TBR) and Digitally eNhanced Accuracy (DNA) systems are used to provide precise ranges and shot-correction recommendations. The TBR uses the rangefinder and inclinometer to calculate range and angle. The TBR then uses information about the weapon and projectile being used, and recommends elevation corrections. This system works for a range of weapons from rifles to bows. The DNA algorithm provides ranging accuracy of up to 1/10 of a yard. Using the TBR and DNA helps eliminate shooting errors and the need to make correction calculations yourself. A non-corrective line of sight mode is also available for straight distances without adjustments being made for incline, weapon or load. The display utilizes an Organic LED that provides clear and bright images. The OLED reflects the display information into the optical path. Projecting the information eliminates LCD display films often used in rangefinders that can interfere with light transmission, which reduces image brightness. When using the RX-1000i as a traditional monocular, the OLED will not affect the views when not in use, unlike traditional display films. The quick set menu makes the rangefinding, operation modes, and display options quick and easy to use in the field. Three different reticle patterns make acquiring and tracking targets easy and precision ranging simple. Low, Medium, and High display intensities enable it to be tailored to the lighting conditions. Single, continuous-scan, and last-target modes offer multiple ranging techniques depending on the situation. The battery will last through at least 10,000 measurements, and the battery-indicator on the OLED display constantly updates the power status. To conserve power, the unit will automatically turn off after 7 seconds.